friendships as they are challenged to grow in a relationship with God. between classes with a game, a nap or a snack, it is just the place for you. The BCM is a student organization open to any and all Walters State students. The only requirement is participation. The BCM is supported by local Baptist churches, but everyone is welcome no matter your denominational or religious background or even no background at all. 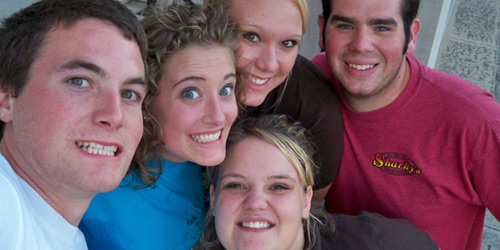 The BCM is led by a student leadership team that is elected annual. There are additional requirements to be a leadership team member. The most important thing is to just come by the building and meet a few people, fill out an info card and find out when stuff is going on. You can do this anytime during the semester, but why not come by as soon as possible. We have a number of special welcome to campus activities the first week of the semester. What Do You Do In BCM? Many students hang out at the building throughout the week before, between or after classes. Every Wednesday from 11:30 -1:00 local churches bring home cooked meals for students & staff to enjoy. We ask only a $2.50 donation and the money goes to support student mission trips. Most every semester there are a number of weekly Bible Study and Worship opportunities for students. Times and Days change from semester to semester depending on student schedules. Each year the BCM hosts retreat and conference trips for students. The schedule and specifics of these events change from year to year, however we usually will have a regional discipleship retreat in the Fall and a statewide Leadership conference in the Spring. Each year the BCM also provides students with numerous mission and ministry opportunities. Often these include local ongoing ministry opportunities, group Fall and/or Spring Break mission trips, and opportunities to serve literally around the world during the summer. The BCM Building is located on the Morristown campus. If you locate the Tennis Courts on campus simply turn up the only road that runs beside them and past the baseball field. The BCM building is the only thing at the end of this road. Simply turn at the tennis courts and we are the only thing at the end of that short road.